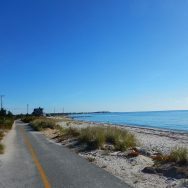 The Shining Sea Bikeway follows the original route of the New York, New Haven and Hartford Railroad that used to run from Buzzards Bay, through North and West Falmouth, around Woods Hole and into Falmouth Station. Enjoy a leisurely ride with us and stop for coffee before the return ride. Drive to Cape Cod and cross over the Bourne Bridge. Follow Rt. 28 South to the Rt. 151, North Falmouth, Mashpee exit. Take that exit and turn left at the end of the exit ramp onto Rt.151 west. Go through one traffic light following signs to North Falmouth. After crossing the train tracks turn right into the Depot Rd. parking lot.